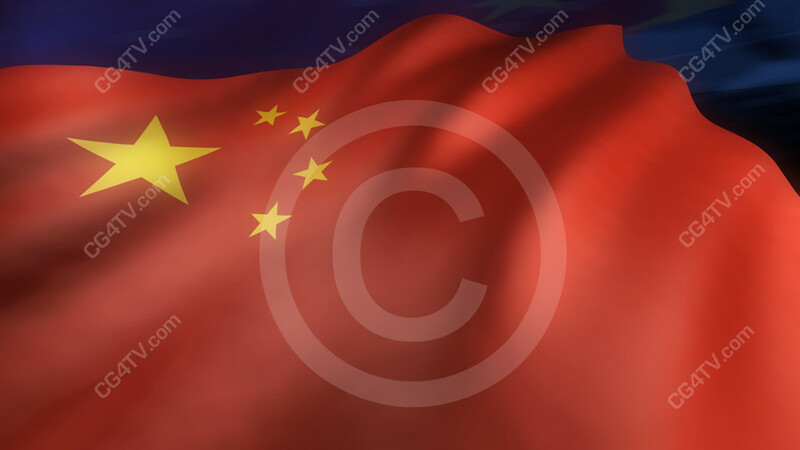 Royalty free Chinese flag looping 3D animation. Available in HDTV (1920 x 1080) resolution, standard NTSC and PAL, and web optimized resolution. Every National Flag flies as a globally recognized symbol of the nation it represents as well as that nation's people and their spirit. The Chinese Flag is no exception. 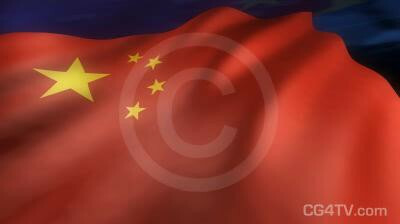 Serving as an icon to China's people, the Chinese Flag is a recognition-at-a-glance 3D Animation Image that immediately invokes thought of the Chinese Flag's country of origin to the world community. In fact all of the high quality HD National Flag 3D Animations here at CG4TV.com employ 300 frames in order to achieve the smooth undulating ripple effect of the constantly flowing wind ruffling the Flags' surface. Each HD National Flag 3D Animation will be just as useful as well since every nation is a part of the global political community and every National Flag has it's place at national and global holidays and events. Don't Forget! All of our stock 3D Animations are Royalty-free so you'll be enjoying substantial savings over having a custom 3D Animation prepared; and we're constantly adding to our stock 3D Animation collection so you're sure to find just the right 3D Animation for all of your projects. In addition to incredible savings, every one of these 3D Animations is available for you to download right now for immediate gratification of your 3D Animation needs. If you don't happen to see a 3D Animation that works for you, please feel free to contact us at info@cg4tv.com we're always open to suggestion for additions to our 3D Animation catalog or any of our Stock Image, Virtual Set or Animated Background collections. CG4TV.com is the virtual art gallery for all your empty electronic-space needs. Order your Chinese Flag 3D Animation and download your 3D Animation right now, instantly, with just a few simple clicks of your mouse! If you have any questions regarding our 3D Animations, please feel free to email us info@cg4tv.com.